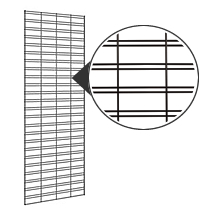 Slatgrid Panels - 2 Ft.X 7 Ft. The Slatgrid Panels can accommodate both slatwall and grid shelves, hooks and accessories making this the most versatile product. Hang Slatgrid Panels on your wall to make the perfect merchandising display. Use Panel connectors, bases or legs to make a floor display. Great for increasing impulse sales on candy, snacks, software, books, CDs and more. Units feature double wire construction. Wire is 1/4 in. Available in Chrome, Black or White. The Slatgrid Panels are 2 ft w x 7 ft h.